The new Hyundai i10 has extra kit and styling. This is the stylish new Hyundai i10 which features the firm’s new cascading grille and comes packed with extra kit to offer an interesting alternative in the city car segment. Indeed, the current model has racked up lots of awards and the latest creation looks like setting new standards. 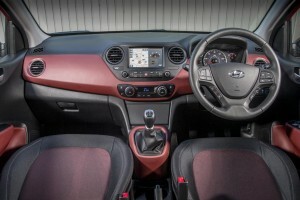 On board, drivers will get to enjoy an integrated 7-inch touchscreen for satnav and Apple Play and Android Auto and for those drivers with the top end Hyundai i10 Premium will find they have a ‘live’ service which is a first for the segment. Exterior styling tweaks for the Hyundai i10 include a new bumper design, LED headlights and round fog lights as well as refreshed rear light clusters. There’s also a wide range of new safety features including forward collision warning system and lane departure warning system. However, the carmaker says it is responding to customer demand with improved connectivity features though this is a growing trend for all carmakers. The new touchscreen has seamless integration with smartphones while the Premium SE model comes with a free seven-year subscription to the firm’s LIVE service which delivers weather conditions and real-time traffic information. Behind the wheel, the Hyundai i10 offers a more comfortable ride thanks to larger front shock absorbers to help deal with bumps and the steering has been modified to deliver a more direct feel. The car also has a lower suspension noise transmission so it’s quieter in the cabin. 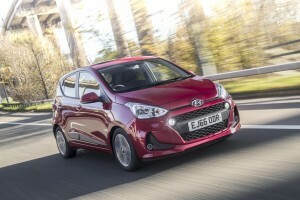 Prices for the Hyundai i10 start at £9,250 for the S model which features new 14 inch steel wheels and covers, a rear spoiler with an integrated brake light, electric windows and remote central locking. Standard features for the entry level model include brake assist system, electronic stability and tyre pressure monitoring. The car features a 1.0 litre three-cylinder engine with a five-speed manual gearbox. Other models come with Bluetooth connectivity, cruise control, air conditioning and DVB radio. The top models feature privacy glass, 14-inch alloy wheels, a leather steering wheel and climate control with prices for the range topping Premium SE start at £12,800. In addition to the 1.0 litre engine, the Hyundai i10 is also available with a 1.2 litre four-cylinder unit and a choice of automatic or manual transmissions. All of the engines deliver impressive levels of fuel economy with the Hyundai i10 SE Blue offering 71 mpg on the combined cycle thanks to smaller wheels and stop and go to help save fuel. Along with being an award-winning, the Hyundai i10 has offered those wanting a city car an interesting and good performing vehicle in a competitive segment and the new vehicle looks like it will build on the current model’s success.